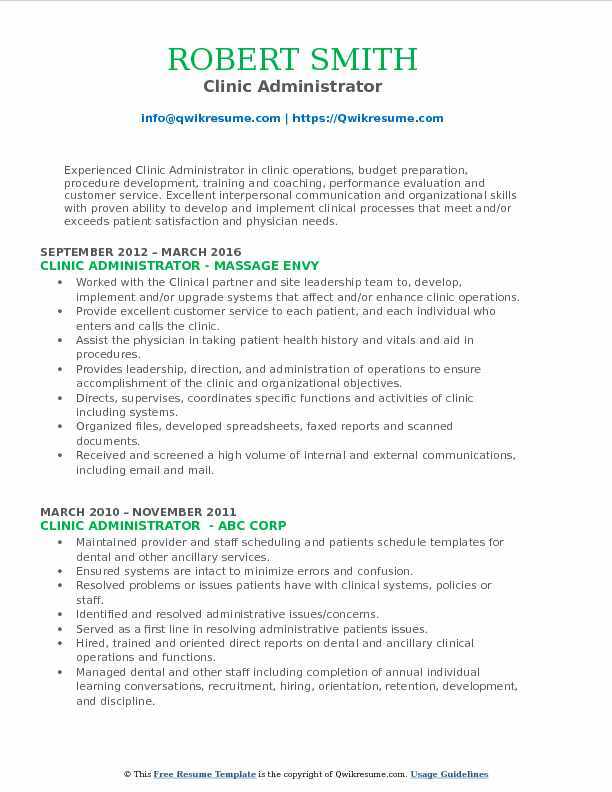 The role of a Clinic Administrator is to oversee the day-to-day operations of a clinical facility. The Clinic Administrator is responsible for patient relation, facility’s fiscal management, and personnel administration. The guidance and support provided by these administrators are crucial for the Clinic’s profitability and success. 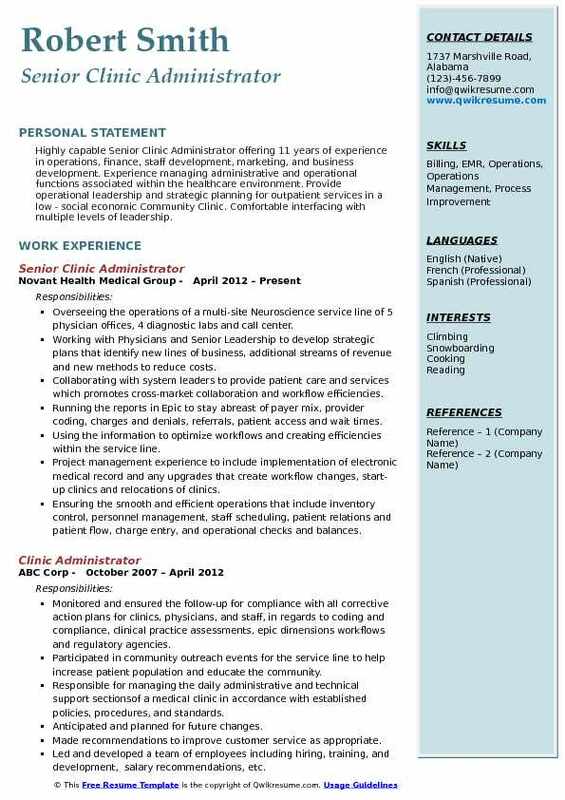 The common duties listed on the Clinic Administrator Resume are – screening, hiring and supervising employees, developing and implementing policies and procedures, ensuring optimal patient relation, developing and approving budgets, serving as a consultant, and overseeing the operations of the clinic. 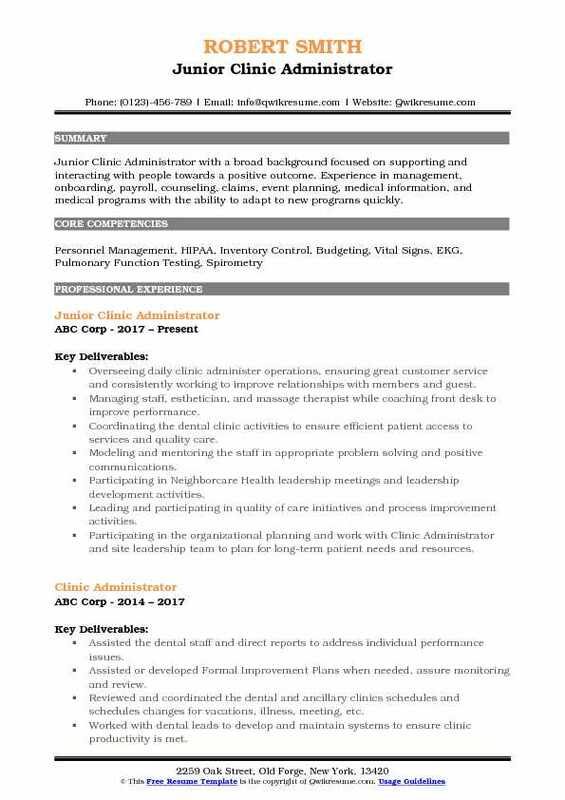 The summary of skills expected for this post includes – extensive knowledge of healthcare administration and clinic philosophy; familiarity with fiscal management systems, knowledge of basic operating systems, excellent supervisory skills, and a thorough knowledge of human resources management. To gain this challenging position, a Bachelor’s degree in Business Administration along with relevant work experience is required. 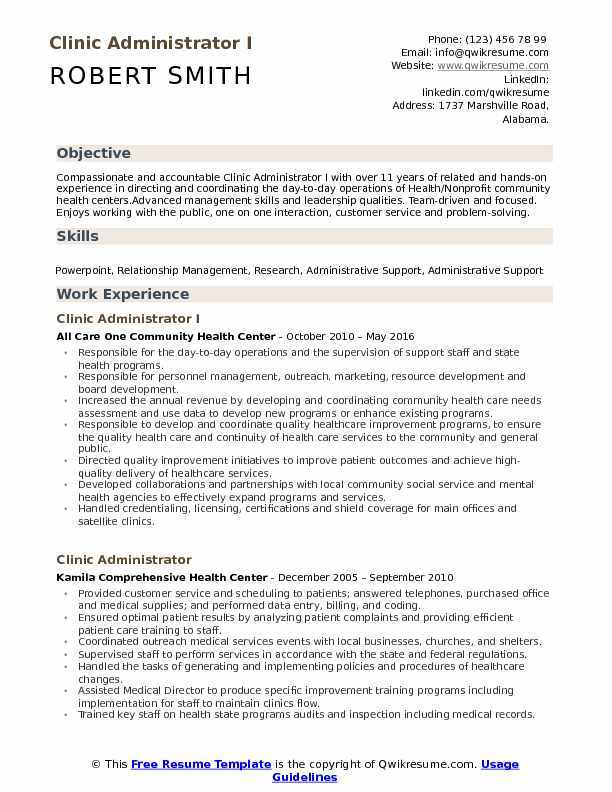 Summary : Compassionate and accountable Clinic Administrator I with over 11 years of related and hands-on experience in directing and coordinating the day-to-day operations of Health/Nonprofit community health centers.Advanced management skills and leadership qualities. Team-driven and focused. Enjoys working with the public, one on one interaction, customer service and problem-solving. Responsible for the day-to-day operations and the supervision of support staff and state health programs. Responsible for personnel management, outreach, marketing, resource development and board development. Increased the annual revenue by developing and coordinating community health care needs assessment and use data to develop new programs or enhance existing programs. Responsible to develop and coordinate quality healthcare improvement programs, to ensure the quality health care and continuity of health care services to the community and general public. Directed quality improvement initiatives to improve patient outcomes and achieve high-quality delivery of healthcare services. Developed collaborations and partnerships with local community social service and mental health agencies to effectively expand programs and services. Handled credentialing, licensing, certifications and shield coverage for main offices and satellite clinics. Responsible for checking risk management proposals and quality assurance plans. 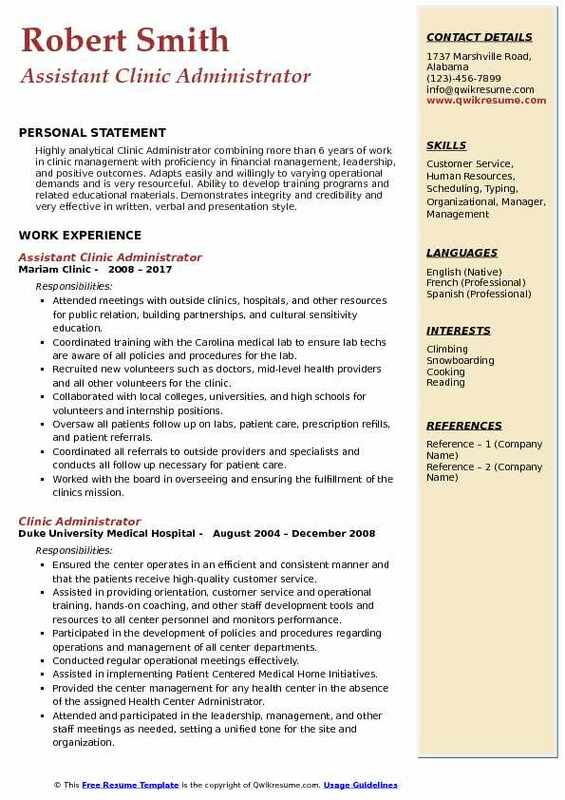 Headline : Clinic Administrator with more than 6 years of progressive management experience in a Community Clinic setting. Excellent communication, interpersonal and leadership skills. Expertise in outpatient, primary care services, operations, finance, strategic planning, implementation of an electronic health record and practice management system. Exceeded strategic objective to reduce the broken appointment rate from 40% to 22%. Fully executed the transition from paper to a paperless electronic health record with an integrated management system, nextgen, and became a superuser, training and assisting more than 70 staff members and providers during this transition. Trained staff on the joint commission standards and organizational policies and procedures on an ongoing basis. Ensured that the staff evaluations are completed timely and effectively adhering to the company's policy, and conducted meetings with staff, providers, and supervisors on a weekly and or monthly basis. Monitored clinic efficiency through workflow analysis of patient visit cycle time, session start time and patient seen within 15 minutes, and productivity. Monitored, improvements of meaningful use criteria through medical records audits and following and monitoring the quality of care program guidelines. Maintained compliance with regulatory and accreditation standards for health care organizations and prepared for external agency facility reviews, managed care, title x, the comprehensive perinatal program, measures and other external agencies. Partnered with, executive leadership, clinic managers, finance, billing, compliance, departments to develop, analyze, and execute the operating budget. 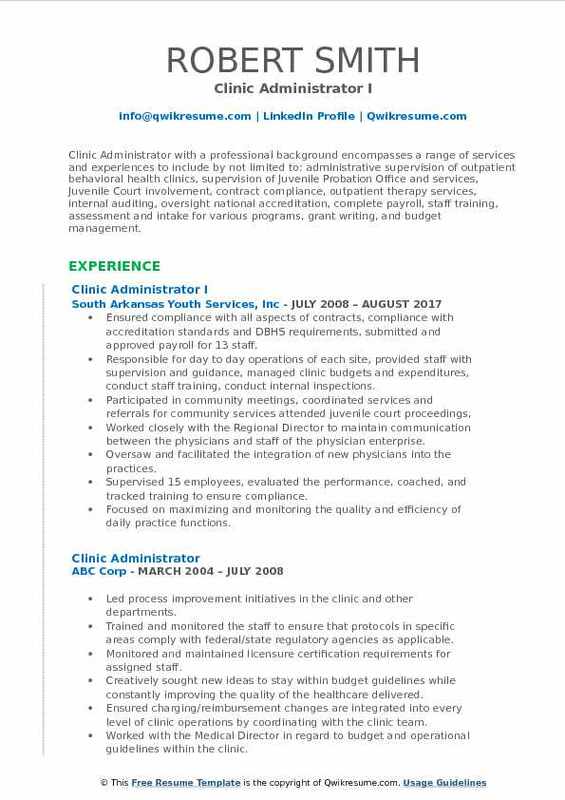 Summary : Clinic Administrator II with 15 years of experience in healthcare leadership within administration where the utilization of my leadership skill, training experience, and patient/client relation will serve as an asset to the organization. Managed the business records and interactions with external legal and professional service providers. Responsible for planning, coordinating, directing and monitoring all operational aspects of the clinic. Analyzed and staffed the front and back office to meet the needs of healthcare professionals and patients efficiently and courteously. Worked with the Nurse Manager, Medical Assistants, and physicians to ensure quality customer service, control costs, meet provider productivity ratios and ensure a favorable medical visit payer mix in the clinic. Assisted the CEO with the development and implementation of departmental goals, policies, procedures, budgets, and reporting tools. Promoted a team approach to delivering quality, cost-efficient care where patient satisfaction is the primary goal. Coordinated providers schedule and the scheduling of patients, monitor appointment availability (access) and implemented changes as needed. In conjunction with the designated Medical Director, worked to enhance provider satisfaction and, when necessary, assisted in resolving provider related issues. Maintained a professional facility appearance that meets the expectations of patients. Summary : Clinic Administrator with a professional background encompasses a range of services and experiences to include by not limited to: administrative supervision of outpatient behavioral health clinics, supervision of Juvenile Probation Office and services, Juvenile Court involvement, contract compliance, outpatient therapy services, internal auditing, oversight national accreditation, complete payroll, staff training, assessment and intake for various programs, grant writing, and budget management. Ensured compliance with all aspects of contracts, compliance with accreditation standards and DBHS requirements, submitted and approved payroll for 13 staff. Responsible for day to day operations of each site, provided staff with supervision and guidance, managed clinic budgets and expenditures, conduct staff training, conduct internal inspections. Worked closely with the Regional Director to maintain communication between the physicians and staff of the physician enterprise. Oversaw and facilitated the integration of new physicians into the practices. Supervised 15 employees, evaluated the performance, coached, and tracked training to ensure compliance. Focused on maximizing and monitoring the quality and efficiency of daily practice functions. Responsible for financial, clinical, and daily operations of each office. Summary : Highly capable Senior Clinic Administrator offering 11 years of experience in operations, finance, staff development, marketing, and business development. Experience managing administrative and operational functions associated within the healthcare environment. Provide operational leadership and strategic planning for outpatient services in a low - social economic Community Clinic. Comfortable interfacing with multiple levels of leadership. Overseeing the operations of a multi-site Neuroscience service line of 5 physician offices, 4 diagnostic labs and call center. Working with Physicians and Senior Leadership to develop strategic plans that identify new lines of business, additional streams of revenue and new methods to reduce costs. Collaborating with system leaders to provide patient care and services which promotes cross-market collaboration and workflow efficiencies. Running the reports in Epic to stay abreast of payer mix, provider coding, charges and denials, referrals, patient access and wait times. Using the information to optimize workflows and creating efficiencies within the service line. Project management experience to include implementation of electronic medical record and any upgrades that create workflow changes, start-up clinics and relocations of clinics. Ensuring the smooth and efficient operations that include inventory control, personnel management, staff scheduling, patient relations and patient flow, charge entry, and operational checks and balances. 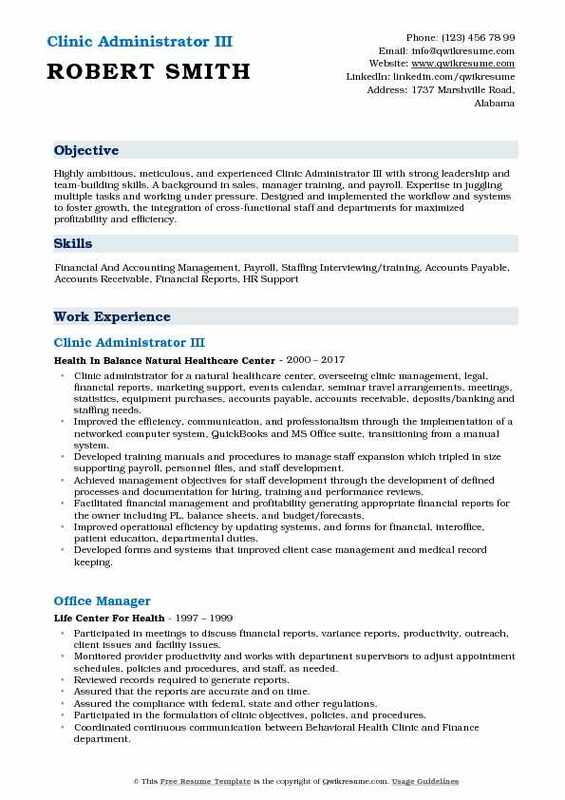 Summary : Highly ambitious, meticulous, and experienced Clinic Administrator III with strong leadership and team-building skills. A background in sales, manager training, and payroll. Expertise in juggling multiple tasks and working under pressure. Designed and implemented the workflow and systems to foster growth, the integration of cross-functional staff and departments for maximized profitability and efficiency. 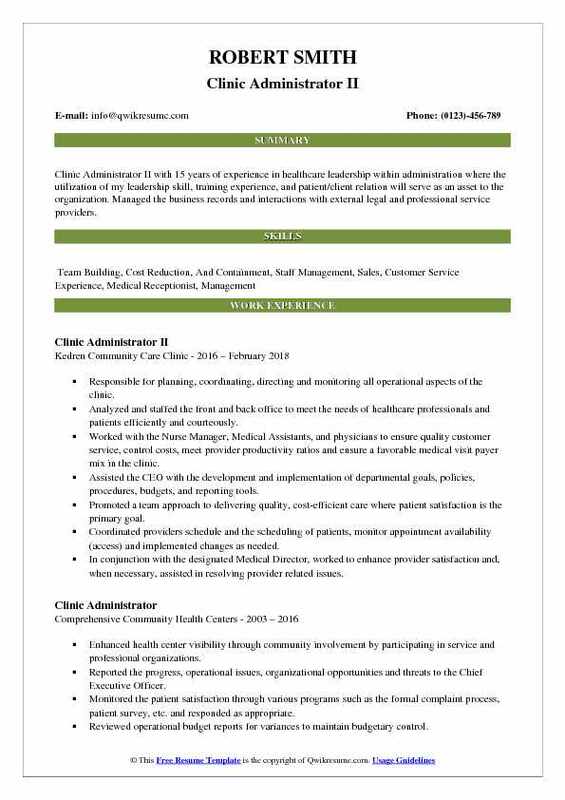 Clinic administrator for a natural healthcare center, overseeing clinic management, legal, financial reports, marketing support, events calendar, seminar travel arrangements, meetings, statistics, equipment purchases, accounts payable, accounts receivable, deposits/banking and staffing needs. Improved the efficiency, communication, and professionalism through the implementation of a networked computer system, QuickBooks and MS Office suite, transitioning from a manual system. Developed training manuals and procedures to manage staff expansion which tripled in size supporting payroll, personnel files, and staff development. Achieved management objectives for staff development through the development of defined processes and documentation for hiring, training and performance reviews. Facilitated financial management and profitability generating appropriate financial reports for the owner including PL, balance sheets, and budget/forecasts. Improved operational efficiency by updating systems, and forms for financial, interoffice, patient education, departmental duties. Developed forms and systems that improved client case management and medical record keeping. 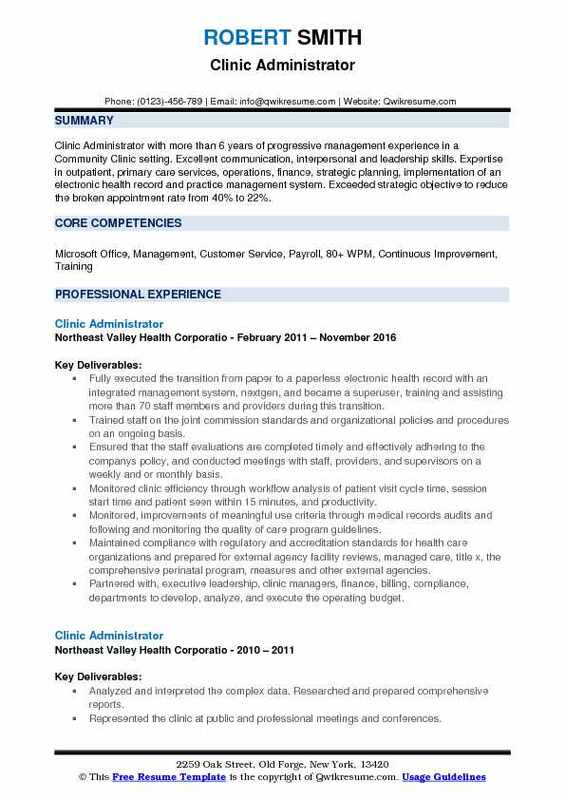 Headline : Experienced Clinic Administrator in clinic operations, budget preparation, procedure development, training and coaching, performance evaluation and customer service. Excellent interpersonal communication and organizational skills with proven ability to develop and implement clinical processes that meet and/or exceeds patient satisfaction and physician needs. Worked with the Clinical partner and site leadership team to, develop, implement and/or upgrade systems that affect and/or enhance clinic operations. Provide excellent customer service to each patient, and each individual who enters and calls the clinic. Assist the physician in taking patient health history and vitals and aid in procedures. Provides leadership, direction, and administration of operations to ensure accomplishment of the clinic and organizational objectives. Directs, supervises, coordinates specific functions and activities of clinic including systems. Objective : Junior Clinic Administrator with a broad background focused on supporting and interacting with people towards a positive outcome. Experience in management, onboarding, payroll, counseling, claims, event planning, medical information, and medical programs with the ability to adapt to new programs quickly. Overseeing daily clinic administer operations, ensuring great customer service and consistently working to improve relationships with members and guest. Managing staff, esthetician, and massage therapist while coaching front desk to improve performance. Coordinating the dental clinic activities to ensure efficient patient access to services and quality care. Modeling and mentoring the staff in appropriate problem solving and positive communications. Participating in Neighborcare Health leadership meetings and leadership development activities. Leading and participating in quality of care initiatives and process improvement activities. Participating in the organizational planning and work with Clinic Administrator and site leadership team to plan for long-term patient needs and resources. Maintaining professionalism and confidentiality in administration and patient care areas. Assuring annual learning conversations with dental staff and direct reports are completed according to the organization's evaluation calendar. Summary : Highly analytical Clinic Administrator combining more than 6 years of work in clinic management with proficiency in financial management, leadership, and positive outcomes. Adapts easily and willingly to varying operational demands and is very resourceful. Ability to develop training programs and related educational materials. Demonstrates integrity and credibility and very effective in written, verbal and presentation style. Attended meetings with outside clinics, hospitals, and other resources for public relation, building partnerships, and cultural sensitivity education. Coordinated training with the Carolina medical lab to ensure lab techs are aware of all policies and procedures for the lab. Recruited new volunteers such as doctors, mid-level health providers and all other volunteers for the clinic. Collaborated with local colleges, universities, and high schools for volunteers and internship positions. Oversaw all patients follow up on labs, patient care, prescription refills, and patient referrals. Coordinated all referrals to outside providers and specialists and conducts all follow up necessary for patient care. Worked with the board in overseeing and ensuring the fulfillment of the clinic's mission. Ensured compliance with all regulatory agencies, departmental and organizational policies and procedures for staff. Ensured the provider scheduling is accurate and meets the needs of patients. 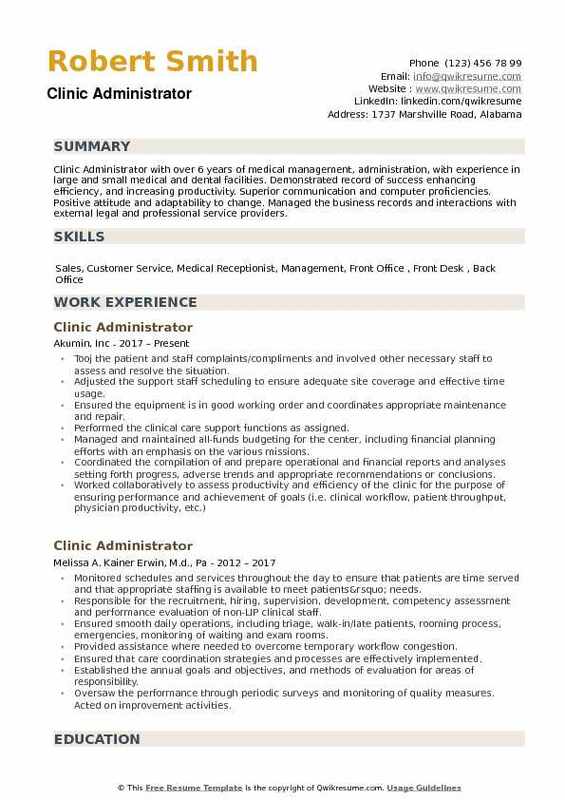 Headline : Clinic Administrator with over 6 years of medical management, administration, with experience in large and small medical and dental facilities. Demonstrated record of success enhancing efficiency, and increasing productivity. Superior communication and computer proficiencies. Positive attitude and adaptability to change. Managed the business records and interactions with external legal and professional service providers. Tooj the patient and staff complaints/compliments and involved other necessary staff to assess and resolve the situation. Adjusted the support staff scheduling to ensure adequate site coverage and effective time usage. Ensured the equipment is in good working order and coordinates appropriate maintenance and repair. Performed the clinical care support functions as assigned. Managed and maintained all-funds budgeting for the center, including financial planning efforts with an emphasis on the various missions. Coordinated the compilation of and prepare operational and financial reports and analyses setting forth progress, adverse trends and appropriate recommendations or conclusions. Evaluated the staff performance, identified the opportunities for performance improvement and defined plans for performance goal achievement, as outlined in the organization's performance evaluation policies.